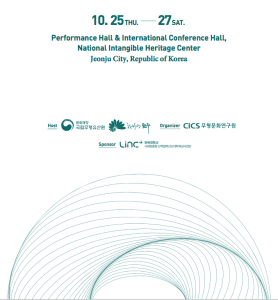 The 2018 World Forum of Intangible Cultural Heritage (ICH) will be held in Jeonju City, Republic of Korea, hosted by the National Intangible Heritage Center (NICH) and the Center for Intangible Culture Studies (CICS) from 25 to 27 October 2018. The forum will open a new chapter in the discussion on the future of ICH and its potential roles and functions under the theme of ‘Intangible Cultural Heritage and Peace-making’ in accordance with the articles of UNESCO’s Convention Operational Directives VI. 4, 192-7. We endeavor to promote the contribution of safeguarding of ICH to social cohesion and resolving disparities. We also consider the threats of war, immigration and natural disasters, which endanger ICH. We hope to advance these important topics during the World ICH Forum. 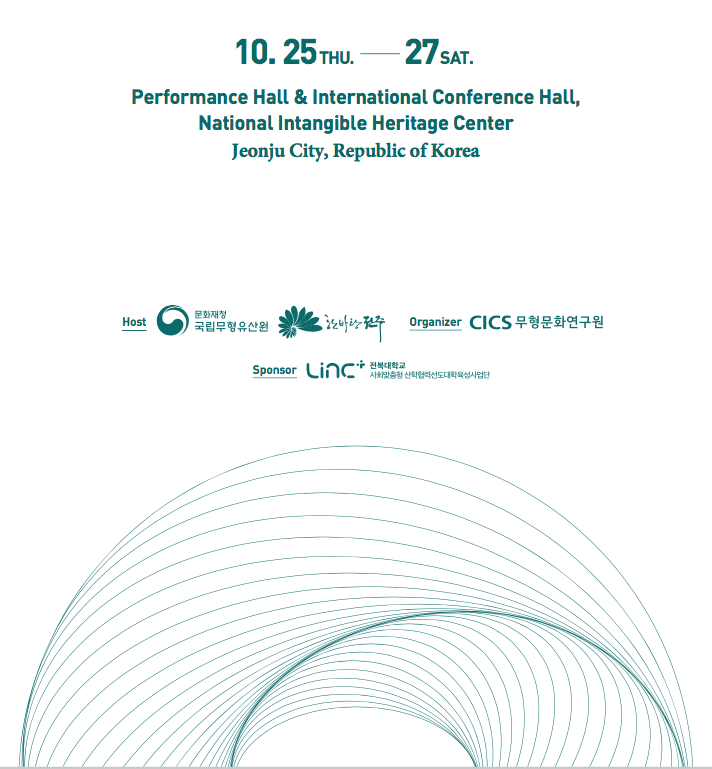 The NICH (www.nihc.go.kr) carries out various activities such as research, archive, exhibition, education, performance, and support for bearers for safeguarding, transmitting, and fostering ICH. In addition, the NICH aims to become a hub of the ICH of Korea through networks with various countries. The Center for Intangible Culture Studies (CICS), an UNESCO accredited organization, is collaborating on the organization of the forum. CICS is dedicated to the study of the ICH of individuals, groups and communities, and to documenting, inventorying, and advising on the ICH. The UNESCO ICH Safeguarding Convention recognizes that the safeguarding of ICH is an invaluable resource for overcoming a series of crises facing human society and peace-making and peace building. Although each country has its own unique situation to safeguard its intangible cultural heritage, we share in the belief that ICH is important. At this forum, we will focus on the theme of ‘Intangible Cultural Heritage and Peace-making’ to discuss various functions, roles and meanings of ICH. At the Forum, we will look at peace-making and building peace through ICH focused on various specific cases. We must not, however, ignore the issue of endangered ICH in insecure environments. Many countries in the Mediterranean are seeking sustainable peace through the food culture community. China and Mongolia have formed cultural ties by conducting intangible cultural heritage joint research. In Slovakia and Czech Republic, they also maintain and strengthen their communities by creatively transmitting the ‘trans-regional’ artistic language. While these cases demonstrate hope and vision, such cases remain few in number. .
At the forum, we will discuss the issues mentioned above under the theme of ‘Intangible Cultural Heritage and Peace’. (1) How to make a contribution of safeguarding of ICH to social cohesion and resolving disputes? (2) How have ICH been and become endangered under the threats of war, immigration and natural disasters? What are the implications of these processes for endangerment? (3) What efforts should be made to encourage and expand the discourse of ‘hope and peace’ through ICH for future generations? The Forum will be made up of five sessions and led by invited speakers. Interested scholars, policy-makers, and heritage experts are invited to the Forum. We would like to share in their unique experiences and perspectives at the Forum. The Forum will provide an opportunity to highlight ‘hope and peace’ through ICH. ICH-relating experts, scholars, and policy-makers in many countries are working to find progressive methods of the ICH safeguarding and of the achievements of sustainable development goals (SDGs). The Form will encourage fruitful discussions by reflecting on the current discourses and issues of safeguarding ICH emphasizing viability, sustainability, cultural diversity and human rights. .